The UBC Collab Theme contains 6 default page layout options. These page layouts can be set for all pages at once, or they can be set for each individual page. Note that an individual page's layout options will overwrite the default layout set for all pages. The layout you pick will be applied to all pages of your site set to the default layout, with the exception of the Frontpage. To customize the layout of the Frontpage, click on the Frontpage tab found under Appearance > Theme Options in the WordPress Dashboard. For more details please refer to this page. In the default layout section, you are presented with 6 options to choose from for the default layout of all the pages in your site. 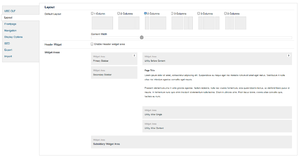 In all of the options, except for the One Column option, you are able to choose the width of the widget sidebar(s) and the content area through the use of a slider. Pictured above is the slider that allows you to control the width of the content area and the widget sidebar for the 2 Columns option. Each option will have a different slider control. The header widget section contains a checkbox that allows you to enable the header widget section in the UBC Collab theme. When enabled, the header widget section will appear just under the site's navigation bar. The widget areas section does not contain any controls for the user. It is merely a preview of what the default page layout of the site. As you make changes to the default layout, the widget areas section will update automatically as changes are made. You can also customize the layout of a particular page while creating or editing a page by selecting one of the 6 pre-defined layout options under "Page Layout" on the right-hand side of the screen in the Page Editor. You can customize the layout of a single page by placing the "Page Layout" metabox from the side to the centre column, it will enable you to adjust the width of the side bars on a page by page basis. just like in the Theme Options -> Default Layout section.